It’s becoming increasingly less useful to promote your events, classes, or conferences using offline methods, such as print or local television ads. In this day in age, even online methods of advertising, such as Google Ads and Facebook Marketing, are becoming less effective. It’s hard to cut through all of the noise when we get constantly bombarded with messaging about new products, services, and 21st-century gimmicks. Sometimes I wish we could go back to a time like when we were young. Today we are going to talk about the importance of Facebook Marketing, which is currently the oldest, and largest of today’s social media marketing channels. I’ll start off by giving a minor overview of why Facebook is important, then discuss the different tools offered by Facebook, such as Facebook Events, Pages, and Groups. Then finish off by covering a few tips you can use to increase your exposure on the world’s largest social media platform for business. If you’re already aware of the importance of Facebook, please feel free to skip ahead. In case you missed it, last week I gave you a high-level overview of using social media marketing to boost event awareness. Be sure to check it out. In 2016 Facebook had 1.18 billion active users visiting on a daily basis, which accounted for around 66 percent of Facebook’s monthly active users, which is equivalent to around 20,000 users on Facebook every second. 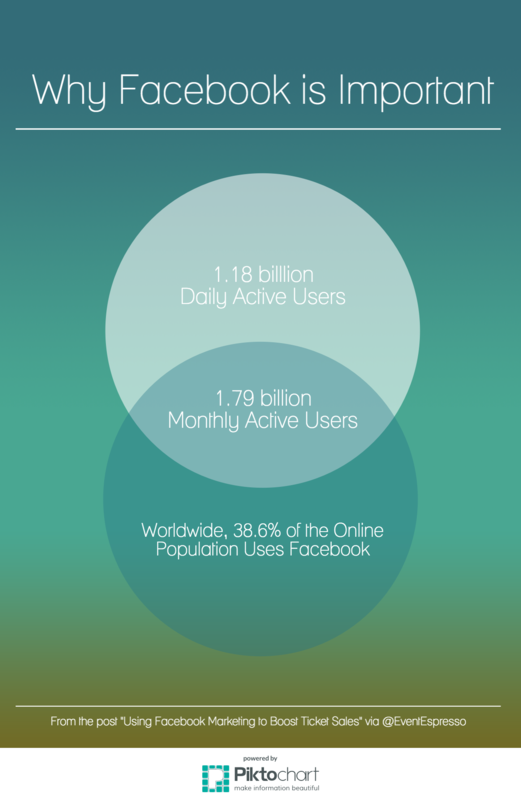 Furthermore, by 2018, experts estimate that over 2.88 billion people will access social networks regularly. 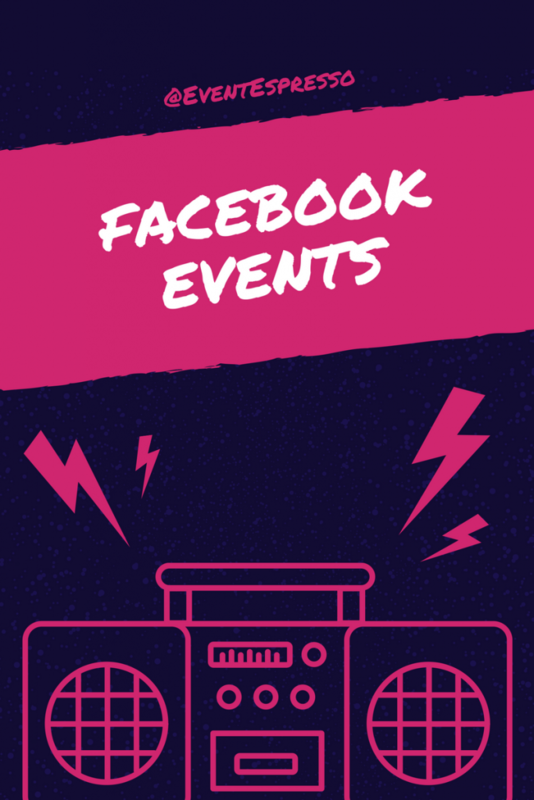 Facebook Events is one of Facebook’s longest running features and boasts 650 million active users, over 47 million public events, with over 35 million events viewed each day. 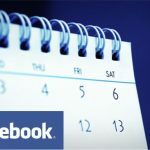 This feature allows Facebook users and page owners to create a calendar-based invitation to an event. A Facebook event can be sent to a select group of people and will include information about the event, the time and date of the event and even images related to the event. In addition to the above, a Facebook event provides a simple, hands-off way for Facebook users to send invitations to their friends. Because of the interactive nature of Facebook, a Facebook event can also help create commenting and buzz about a particular event. 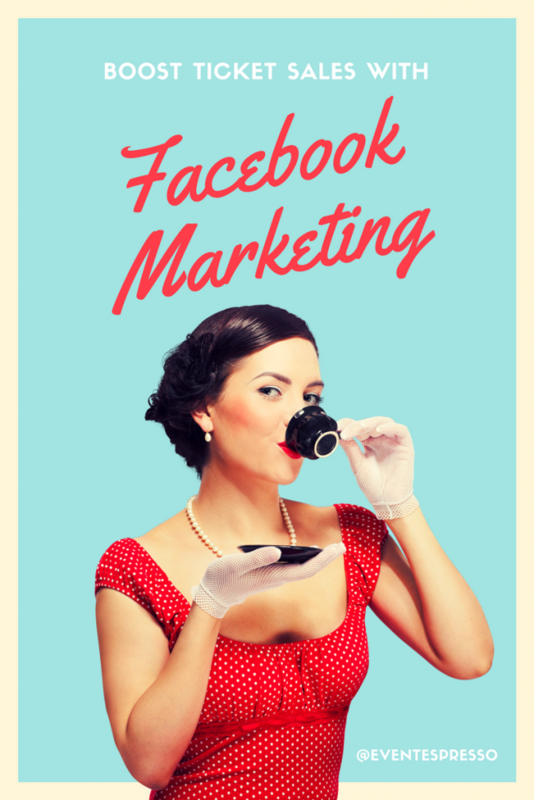 Nothing should stop you from using Facebook in your event marketing strategy. However, I think it’s fun to share a few interesting pro, and cons about each social media tool I review. Facebook Events are significantly easier to add people and act as a central place to field any questions or queries that people have about the particular event. Facebook Events are very easy to set up and are particularly useful for free events. If you’re running free events, you can get an idea of RSVP numbers and see at a glance who is attending and who isn’t. Sharing of photos and videos on a Facebook Event provides a convenient, central point where attendees can collect memories of the occasion and keep a permanent record, which is particularly valuable for significant events like weddings and birthdays. Facebook Events are difficult to find on Facebook. If we have a hard time finding them, then our guests will have a hard time, too. Event Pages are not ideal for paid events as the number of attendees RSVP to the Facebook Event can be completely different to what your ticket sales resemble. Relying on Facebook to plan an event means you run the risk of forgetting about friends and relatives who aren’t signed up to the network, or who are signed up but rarely use it. How Can Event Planners Use Facebook Events? Facebook has become ubiquitous for those planning more than the occasional Backyard BBQ, too, whether you ‘like’ it or not. Add your event’s website link to the Ticket URL field – When you use this feature, your event page will show a “Tickets” button. This button makes it easier for people to buy tickets and unlocks the ability to create ads optimized to drive ticket sales. If you’re an event organizer that uses Official Events through Ticketmaster or Eventbrite, you can sell tickets directly on Facebook through the Facebook Official Events API. 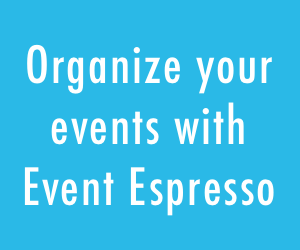 Event Espresso users can copy and paste the event URL from their website directly into the Ticket URL field. Invite everyone you know on Facebook to the event – When you invite someone to an event, it builds excitement in the people you’ve asked to attend. People are more likely to accept the event invite and share with their friends that might be interested. Yes, you can “suggest” a page to friends, but that’s not as friendly as an invitation to an event. Easily keep attendees informed of updates – People marked as attending, or invited to the event will receive event updates via Facebook when you post updates to the event page. If you’ve pre-registered attendees on your website using Event Espresso, or a cloud based ticketing service such as Event Smart, just Invite your pre-registered participants to join the Facebook event to help keep them informed of updates and build excitement around the event. People that haven’t pre-registered via your website can be encouraged to register using the “Tickets” button mentioned above. Events can be made public or private – If you select Public: Anyone on Facebook will be able to see the event, even if you are not friends with them. If you choose Private: Only people invited to the event will be able to see it. If you decide not to ask someone to join, don’t worry – won’t be able to see anything about the event in their feed, and they will never get any notifications about it. Ever. Learn how to create compelling Facebook events – Event promotion is a separate, complex subject from this post. However, Sprout Social has some great tips in their post, “13 Ways to Use Facebook Events for Your Brand“. Please Note: No matter where you create the event from (personal profile or page), you can only invite people who are from your own friend’s list. If you need to reach more people, consider paying for promotion on Facebook and adding a link to the public event (on Facebook) after someone pays for a ticket on your website. If you’re an active Facebook user, you’ve most likely viewed, or liked many Facebook Business Pages. Similar to a friend’s Facebook profile, Facebook Pages enable public figures, businesses, organizations and other entities to create an authentic and public presence on Facebook. Page owners can also post stories, add a cover photo, host events and more. Unlike (no pun intended) personal profiles, pages do not gain “friends,” but “fans” – which are people who choose to “like” a Page. Facebook user’s who have “liked” a Page will see the Page’s updates in their News Feeds. A few pros, and cons about Facebook Pages. A Facebook Page gives you insights and the tools to advertise, which aren’t available to Group owners. That’s pretty handy if you want to promote an upcoming event, class, or conference. Facebook Pages are ideal for two-way communication: from you to your members and from your members to you (if you allow it), but not so much between members. They are suitable for companies and organizations who want to make announcements to large groups of people. Visitors of a Page become members simply by “liking” the Page. No interaction from you is required. Facebook Messenger for business pages makes it easy to offer prompt one-on-one customer service while keeping a record of the conversation. Pages are mostly a broadcast (and advertising) tool. It can be hard to get your content seen unless you’re willing to pay. It is hard to engage with Facebook users who don’t like or comment on your page. 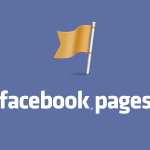 Facebook user’s need to subscribe to page updates to keep receiving them if they don’t frequently engage with a page. Lack of interaction on Facebook and not publishing regular content can reflect very poorly on your business. A Facebook page is not just something to create and then forget. You must remain committed — post regular updates to your fans and provide useful content. 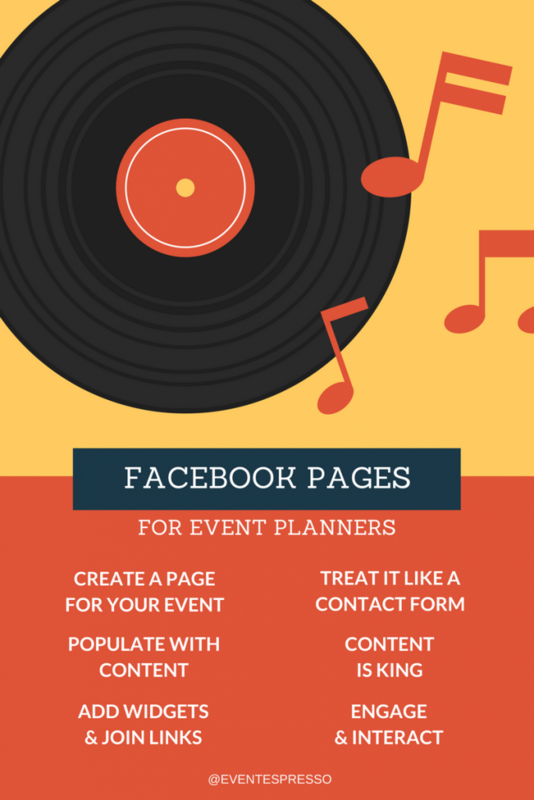 How Can Event Planners Use Facebook Pages? It’s possible your potential attendees/customers use Facebook, so a Facebook Page gives you the opportunity to run ads, promote events, and build an email list. Plus, it helps build credibility when potential customers search for your business online. After the event, your Facebook page will be an excellent platform to thank all of the attendees, volunteers, sponsors, and everyone who helped make the event such a success. Create a Facebook Page for your event – A Facebook Page especially useful if you plan to present an event more than once. Create the page as you would a business page and title it the name of your event. Don’t use the year (as you can’t change a page name once you create it). The page can have as many administrators as you would like. If it’s a smaller meeting, a private Facebook Group will work as well. You just have to invite people individually as they buy tickets from your website. Populate the Facebook Page with content related to your event or business – Your content should be fun and engaging! Facebook is not a business platform. People will be there to follow friends, share stories, and explore new things. Your fans will love to comment on how awesome your event will be. Visual media is important. Photos and video are often best because they are interesting and engaging. The Event Planners Association and Special Events Facebook pages are great examples. Engage and interact with others – To be truly successful, you must commit and interact with like-minded people. Think of it as virtual networking. Liking and commenting on attendee posts can be great. Reach out to other Facebook pages with related content (industry, fan, speaker, exhibitor, etc.) and participate in discussions. Think long-term, not just about awareness for the current event, but an engagement strategy that will make your event a vital component of the community and a significant accentuation point in the relationship with your audiences, whether they be speakers, patrons, vendors, press or otherwise. It’s all about the conversation. Groups are also a great way for connecting family, peers, teammates, co-workers or people with a common interest. Members can ask and answer questions, post about events or job openings and follow conversations about topics that interest them. Additionally, groups allow you to send mass messages directly to the team members’ inbox. When you create a group, you can decide whether to make it publicly available for anyone to join, require administrator approval for members to join or keep it private and by invitation only. Like with Pages, new posts by a group will show in the News Feeds of its members and members can interact and share with one another from the group. Visitors of a group can become members by “joining” the group and waiting for approval from a Group administrator. Visitors to a group can’t post to the Group wall until they become members (i.e., after an administrator has approved them), even in “open” groups. Yes, there’s pros, and cons here. Facebook groups are active with many discussions and promote online community. Participation is optional, only the people who want to be there show up. Facebook Groups allow regular communication between all members of the group, which is ideal for friends or enthusiasts who want to talk between themselves with no one person or organization dominating. How can Event Planners use Facebook Groups? You may already use Facebook groups for networking, but you can also create your Facebook groups to grow your event business and nurture customer relationships. Starting your own Facebook Group – Let’s say you teach art classes, you can start a group that centers on paint and wine parties. Other art lovers will join; people will talk about their painting styles and their favorite artists. They’ll post pictures, share experiences, and you’ll be at the center of it all. Using groups to show your expertise – When you grow a thriving community, people look to you for expertise. If you’re looking for community engagement and want to share ideas and feedback with your customers/attendees, you might try starting a Facebook Group. 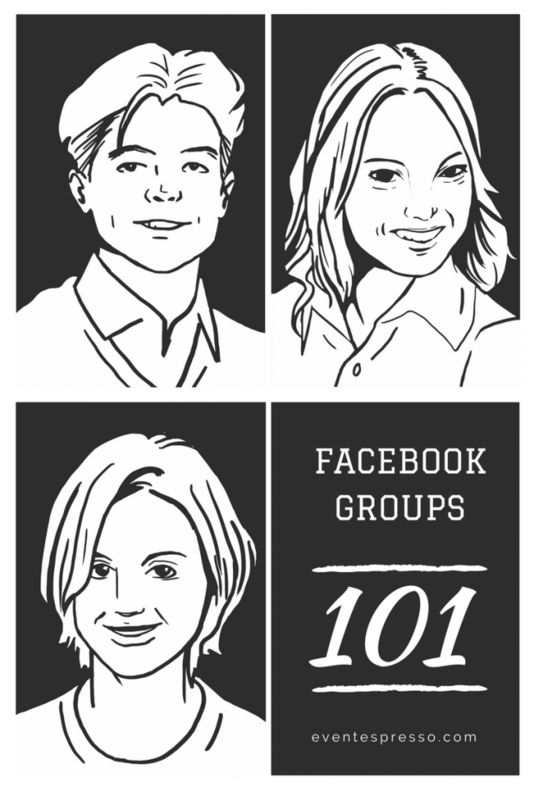 The most successful Facebook Groups have several thousand members, and they’re very active. The questions and advice are in abundance. Don’t join groups to promote yourself – Joining a Facebook group only for the sake of promoting yourself and your business looks spammy, and is not classy. People in these Facebook groups are always asking questions and in need of help. If you can assist in any way, be sure to write something useful. If posting a link is necessary (such as a step by step tutorial), then you can add it. Don’t make it spammy by just throwing your link out there. Solve the problem and then suggest they check your link for instructions. Read and respect the rules of the Facebook group – Almost every Facebook group has rules and regulations they have put in place to help run the organization efficiently. You might find that some of the groups are strictly for promos and others require you to participate and show your expertise. Don’t get yourself kicked out of the group by not following the rules. Before posting, quickly read the rules to ensure you are on the right track. 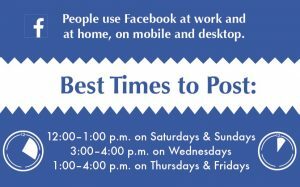 Best Times to Post on Facebook – Find out the best time to post for your business. People log in to Facebook on both mobile devices and desktop computers, both at work and at home. 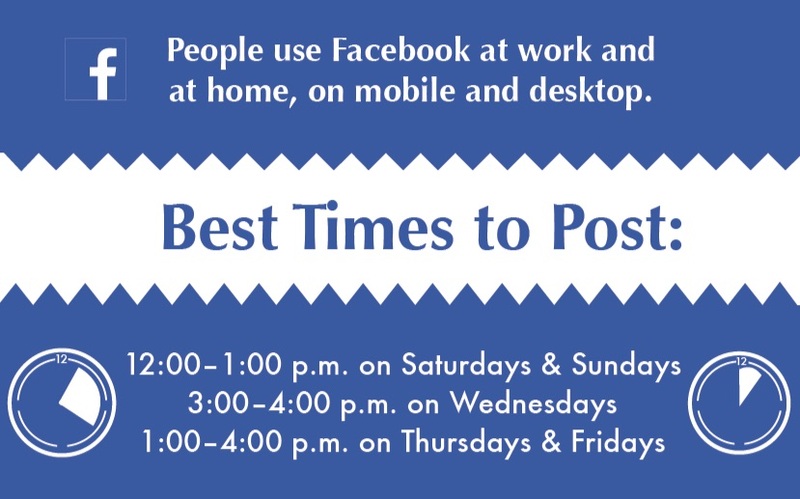 According to HubSpot, the best time to post on Facebook is 3:00 p.m. on Wednesday. Other optimal times include 12:00–1:00 p.m. on Saturdays and Sundays and 1:00–4:00 p.m. on Thursdays and Fridays. Create a single Facebook Page for your event – If your event happened twice a year, keep the same page and just adjust the cover photo and profile image to reflect the upcoming show. Make sure to keep your page title and URL generic, and not unique to one year. Treat your event wall like your page’s wall – Be sure to add your address, info about your event, the date and post links, photos and videos on the event wall. Facebook doesn’t yet allow for a whole lot of customization for event pages, so an active wall is probably your best selling tool once people land on your event page. Create Facebook Ads for your event – Instead of creating an ad for your registration page or ticketing website, try creating an ad for your event. The benefits are a higher click through rate and the ability for people to invite their friends directly from the ad, which makes it super easy for people to make plans around your event! Encourage attendees to engage and share – Create a call to action on your Facebook page.Once participants have signed up for your event, encourage readers to Comment and Like your Facebook Event wall and engage through other social media channels. Create multiple admins and have them invite friends – If you have a group of people working at your event, encourage them to become page administrators. That way they can invite their friends to the event fan page. Facebook does not allow you to send invitations to your existing fans, so your best bet is to post about it often and invite as many people as you know. Use like-able, social media images – Attach photos or videos to text only updates. People “like” or “share” a piece content when it resonates with them, so you should be making content that’s relevant to your audience. An image is more compelling if it evokes a sensory response beyond a purely visual one. Playing to touch, taste, smell or auditory response also makes for more efficient visual marketing. Do your research, what’s trending in the visual world. Sometimes it pays off to check out what the cool kids are doing. 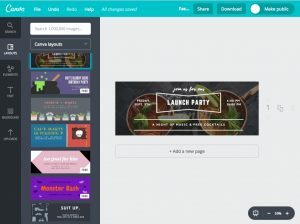 Design apps like Canva and Pablo are perfect for “non-designers” to quickly create professional (looking) social media images, absolutely free. Crowdsource new event and product ideas – Social media is a great place to go to find a large number of people. As you engage your customers, use the opportunity to ask for feedback and suggestions about what events and products they would like to see from you. Many businesses use this tactic use to create a two-way line of communication with their customers. Listen to what your customers have to say about you, your events and services. It’s a great way for businesses to learn what their clients want and can help improve any event you’ve organized. It’s important to show your audience that you appreciate their feedback and are willing to invest your time to answer any questions. Listening to, and acting upon customer feedback helps to build trust in your event attendees and business customers. Follow us on our favorite social media channels for more great ideas – We love hanging out on Facebook, Pinterest, and Twitter. We post on Facebook and Twitter regularly. However, our current favorite social media outlet happens to be Pinterest, where we have several Pinterest Boards geared towards Content Marketing, Event Marketing, and Marketing. Facebook offers many channels to promote your events, event business, and yourself. Tying all of these things together can be a large undertaking, however, if you remain committed to the success of your event(s), you can make it work for you. I recommend spending 15 – 30 minutes a day, or more posting relevant content to your Facebook Marketing outlets. It’s okay to share related articles and tips from influence’s and vendors in your industry. Do you actively make an effort to integrate Facebook Marketing with your events? I’d love to hear why or why not in the comments below.